This Post has already been read 2228 times. 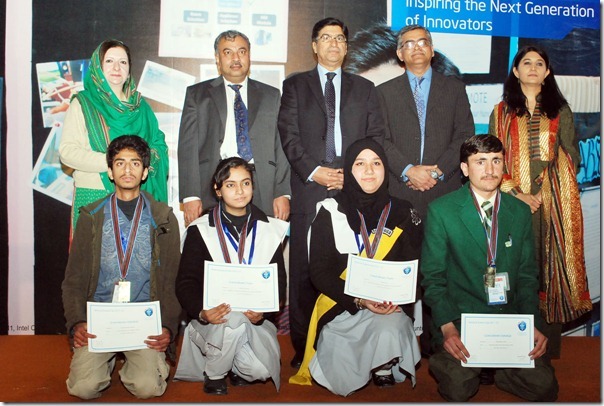 Intel Pakistan marked the end of its national science competion by announcing the winners of the Intel National Science Fair, who will go on to represent Pakistan at Intel International Science & Engineering Fair (ISEF) 2012, to be held in Pittsburgh Pennsylvania USA. The grand winners of the Intel National Science Fair are: Shiza Ghulab, Bushra Shahed and Mahnoor Hassan from Institute of Computer and Management Sciences, Peshawar. Thee individual winners are: Musa Rahim Khan from Agha Khan Higher Secondary School, Chitral; and Syed Shahzed Hussain from Army Public School and College, Command and Staff College, Quetta. Widely attended by the youth from all across Pakistan, the National Science Fair showcased more than 85 science projects submitted by young scientists from all across the nation who qualified for a place in the National Science Fair after rigorous competition at district and provincial levels including the province of KP with participated for the first time in 2011.